Politics is mundane; politicians are servants of the people. Religion is sacred; it guides peoples spiritual growth. Politics is the lowest as far as values are concerned, and religion is the highest as far as values are concerned. They are separate. I want politics not to interfere with religion. The higher has every right to interfere, but the lower has no right to do so. Black people mad Romney's white. White people mad Obama's black. Me? I'm mad no one cares about their policies or our country. Mitt Romney should change his first name to Fetch, because he's never going to happen. If Mitt Romney wins this years election, I volunteer as tribute for the Hunger Games. Obama supporters are like christmas lights. They all hang out together, half of em don't work, and the ones that do work aren't very bright. This quote mean to the world that a stupid person said it. In Mexico an air conditioner is called a politician because it makes a lot of noise but doesn't work very well. A general view about politicians is that they never keep up their promises or offer false promises that cannot be fulfilled and yet people continue to support them. This is a very surprising fact, even to the politicians “politicians are the same all over. They promise to build bridge even where there is no river ‘said Nikita Khrushchev. Very few who are very true and non- corrupt are political leaders but in the process of fighting with the mainstream politicians, they fail to be victorious and hence fade away. So, it is an uphill task to find a sincere and self less politician who is in power. “Ninety percent of the politicians give the other ten percent a bad reputation ‘said Henry Kissinger. The quotes on politicians are- most of them - cynical and take a dig at them like this one. 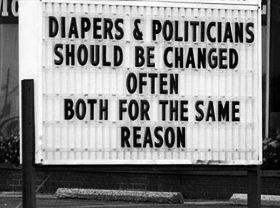 For instance, “Politicians are like diapers. They both need changing regularly and for the same reason”. Read these quotes on politicians and some can be laughed at while some makes you think over.